Voiceovers and Voiceover Talent Including Female Voiceovers Talent including IVR Voice Prompts Recorded At Professional Studios. When you initially contact that important prospective client, you get one opportunity to make a good first impression. Introduce your organization by delivering your message in a clear and professional manner. Let us help by offering a professional voice recording of your important phone greetings, marketing messages, on hold messaging, and special announcements. To view how other businesses and organizations are using our voiceover talent, please visit our Professional VoiceOver Applications web page. Call today at (602) 265-5968 for a FREE analysis and quote. Putting people "on hold" is an unfortunate but unavoidable part of business communications because it's impossible to help everyone immediately. An estimated 70% of business callers are put on hold, and 60% of them hang up and 30% don't call back. If your callers hear nothing while on hold, they may think they've been disconnected. Most callers who hear nothing on hold, hang up within 40 seconds. Callers who receive information and music on hold will wait up to 3 minutes longer! If you use a radio as a sound source, your callers may be annoyed by static, irrelevant traffic reports, and commercials -- even commercials for your competitors. "I just wanted to send you an email thanking you for all of your help! was grinning from ear to ear, he is so pleased with the recording! Anna sounds wonderful and I am so glad that we used your company! Again, thank you so much! I hope we can do business with you again! Morrell of WoodBury utilizes our professional voice talent services to create messages describing its events and also special instructions and directions to its locations. To create this lasting first impression, we contract with professional voice talent that use the latest voice recording studio technology to bring quality and excellence to your organization. 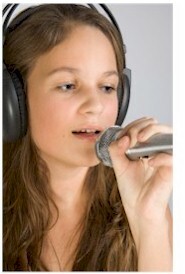 We've compiled a few professional voice talent samples from which you can choose. Click on any of the following names to hear their demos. Remember which voice over talent sample you prefer when contacting us for your professional voice recording. Most requested recordings are 16 bit / 44.1kHz WAV files, the same sample rate used with audio CD's. But we can provide you with WAV, AIFF, VOX, MP3 and many other file types at various sample rates. If you would like a free quote or estimate, please e-mail your script to our Voice Recording department. Don't have a script yet? That's ok, we can help you design one. If you have any questions regarding our voiceover talent or services contact us online or call us at (602) 265-5968. Thank you for your interest and we look forward to working with you.